If you've been following this blog long, you may remember Quid Pro Quo. That was the post in which I told of a brave sheik, and one of the sucess stories of our interaction here in the Anbar province. I would like to refer you to the LA Times, where you will find more detail than I provided, and an account of events since. You're required to register for the site, but it is free to do so and definitely worth the time. The VA Mortgage Center blog contest is over. Acute Politics ended up in 7th place. I will be donating the $250 prize to Project Valour-IT. The food here is the best I've had in the military to date. I don't know how much that really says about it, but it's not too bad. The chow hall is a basic buffet line- a hot food line as you come in the door, an island with salad and other things that food eats, another station with sandwich materials, pasta, and some variety of other hot courses, and a desert bar. The main line has a rotating menu selection. Sunday is steak and seafood, and I don't care enough about the other offerings to pin down what days they appear. I'm usually bored by the first line anyway. Sandwiches are great to make and take along to eat later on mission (which is against the rules, but who's counting?). The rest of the menu on the auxiliary station is what interests me. Occasionally, it's "picnic food" such as mac&cheese, hot dogs, or other such boring offerings, but usually it's ethnic food of one sort or another. Picky eating was bred out of me long ago, and it's at this station I usually head in search of something good to eat. A few days ago, I started with a breakfast of Indian Sheikh Kebab- small seasoned sausages with grilled onions and tomatoes, wrapped in naan flatbread. For lunch I had parts of an MRE because we were out on mission and I forgot a sandwich (Okay, so that was a major low point). Dinner was French Beef Provencale, pork and shrimp stuffed pepper, and spinach salad that I threw orange slices and walnuts into. There's enough diversity in our diet to keep me mostly happy. The thing that bothers me about eating here, and one of the things that I miss most about home, is not being able to cook anything myself. One of my favorite pastimes at home was cooking, preferably something exotic, and here I'm reduced to thumbing through old issues of Bon Appetite at the rec center. Home feels so near I can taste it. I mentioned a few days ago that medics don't find jokes about allergies funny when they are in the process of sticking a needle in your arm. So, I thought you might like to hear about the kinds of things they do find funny. "You know, it's a good thing we aren't in the states." "Well, we ran out of the flu vaccine, so we're having to use the local Hadji copy." "Hey, I need your last name, first name, and social on here." "Well, the aid station seems to have lost the info for the day you got your flu shot, so we have to recollect all of it." It failed to cross my mind that he hadn't been around that day, and would have no idea when exactly I got my flu shot. I reached for the pad and pen, and promptly threw the pad across the table as the shock pen hit me. I have to apologize. I've been remiss in not directing you to Bill Roggio's interview with me. He's had it up for five days now, and it kept slipping my mind to link it on the few occasions I got Blogger to work lately. It's short, but you might find it interesting. Check it out. Well folks, there's three days left on the VA Mortgage Center blog contest. Acute Politics has somehow managed to make it up to 11th place, last time I looked, with 61 votes. There's a lot of big, good, blogs on top, but there's actually a chance I could place in this thing. If you haven't voted yet, go ahead and stop by. A few nights ago we we spent a good portion of the night driving around some of the nastier streets in Falluja. We navigated dirt piles across one road, and then the narrow alleys that bypassed the obstacles blocking the next road we cleared. We dug up suspicious spots in the road, and fended low hanging electrical wires away from our vehicles. 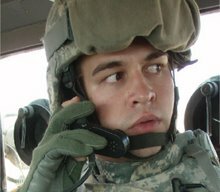 This time, we were out there that night making sure the roads were clear for the Iraqis instead of US troops. This is what they did. Not too bad, I'd say. The Iraqi forces, at least around here, are certainly getting better. The truck stops. I hop down from the turret. TD: So what are we lookin... Oh, that looks nice! SPC W: Hey man, I just had a feeling. SGT F: What's that in the middle? I pull out the binos. TD: It looks like a screwdriver... green handle, kinda bent. We start to move our search out to the sides of the road. We've been sitting and looking for perhaps five minutes now. I move my gaze back to the funny green thing in the road, and as I do so, it disappears with a CRACKKKK-BOOM and the road vanishes behind the hail of sand and gravel. As we sit and listen to the chunks of road ping down on top of the truck, we take a look out at the 3'x2' crater left in the road a bare fifteen feet forward. SPC W: Definitely not a screwdriver. Wow. Walking on History unleashed a storm of traffic on this site completely unlike anything I've seen yet. Patterico linked it, and then Instapundit and Pajamas Media picked it up, and the snowball kept gathering speed. I've added a lot of new blogs to the blogroll- if you've linked to me lately and don't see yours, don't worry. I'm short of time today, but I'll get you in the next couple of days. Pajamas Media has been showcasing the stalwart online oratory of soldier-citizen-poets who will not forsake the mission, their dedication a rebuke to the timid squeaks of us field mice. Pretentious prose style? But I thought I was euphonious! I can't say I ever remember trying to compare myself to Hemingway (or Yeats, as someone suggested elsewhere), but I'm not sure I really mind being compared to Victor Davis Hansen. Actually, I'm flattered that someone so self-important as James Wolcott tore into me in the same column as he tore into Pajamas Media. That's ok, James- keep on keeping us honest over here. Sip your latte as you wade knee-deep through your self-proclaimed Iraqi mire in the comfort of your New York office. In other news, Acute Politics has been nominated in a MilBlog contest over at the VA Mortgage Center . The top blog, as voted by visitors, will receive $3000. Each of the next nine get $250, and all ten get an opportunity to be a guest blogger on their site. If you like what you see here, I encourage you to go vote. If you don't really like what you see here, go over there and vote for one of the others. There's a lot of blogs I think are better than this one, and there's some great ones up for vote. It looks like the military is once again going to require the anthrax vaccination for troops in "high risk" areas: the Middle East and Korea. The vaccination is controversial, to say the least. I chose to take the vaccine voluntarily. It seemed to me that the risks involved were not that great, and I had a hunch that it would become required again while I was in Iraq. I decided that I might as well be further along in the series when that happened, and remove some of the headache from my tour. Today was my fourth shot in the series. I went down to another battalion's medic station to get the shot, along with two others from my platoon and one of the medics. For the fourth time, I glanced over a list of possible side effects and complications, and twice more answered "Yes" when asked "Are you sure you want to receive this shot?". I took off my blouse and rolled up my sleeve. The medic swabbed my skin with an alcohol pad, and stopped with the needle poised over my skin to ask "Are you allergic to any medications?". I replied with a straight face "Only to some vaccine components." Note to self: Medics don't find jokes about allergic reactions funny. For ten or fifteen seconds, I didn't feel anything. That was odd- the first three had felt like the medic filled a syringe with Jack Daniels and shot it into my arm. I was just starting to wonder if perhaps I had received a bad dose when the fire hit me like a swift punch, and kept growing. Thirty seconds longer, and I would have been wishing to get hit with real anthrax just to make the shots worth it, but the burning finally subsided. I have to ask myself: why do I go to so much trouble for something that gives me so much discomfort? I am a shameless romantic, a slightly better than average student of history, and there is a current of idealism under my skin that has not yet been dulled by reality. Sometimes, these qualities come together and leave me thinking to myself of times long gone and stories all but forgotten. Lately, I've been thinking of the paradoxical enormity and insignificance of my presence here. Here I stand, in modern-day Iraq. I have come further to fight here than any soldier of any nation before me, and I fight with weapons and equipment that lay pale the panoply of earlier armies. I represent the pinnacle of force projection and decisive battle, and yet I fight here, where unnumbered young warriors have fought and died through time stretching out of memory. It was on this land that the Babylonian empire first arose out of those first Sumerian agrarians, only to be conquered by the Assyrians, and still later throw off the foreign chains. It was here that Alexander's phalanxes swept by, trailing Hellenism in their wake. Rome, and later the Byzantines, drew their border with Persia at the Euphrates River. At that river was where the Sassanids made their stand against the spread of Arabian Islam. The Khans of the Mongols laid this land waste, sometimes killing only to build their towers of bones higher. This region is steeped in history. We walk on it; we breath it in. Eons of history surround us, infiltrate us, and turn to dust beneath our feet. The ashes of countless cultures, civilizations, and rulers dreams lie under the earth. With each breath, I inhale a few molecules of the dying gasp of Cyrus II, the Persian "Constantine of the East". In the howling wind I can almost hear the cries of a countless multitude dying on killing grounds that bridge across the ages. The same wind carries the red dust that might yet hold a few drops of blood from the battle at Carrhae- the first, crushing defeat for Rome's red blooded legions. Under my heel, a speck grinds into dust: the last grain of sand that remains of the Hanging Gardens at Babylon that are now known only in legend. Some of the world's oldest religions tell us that somewhere in this ancient Cradle of life, God himself breathed on this dust, and it became man, the father of us all. Whatever path we take here, we walk on history. It's time to update the blogroll again. You'll find more people that link to me added on the left. Patterico, who has been very gracious with links and clips. Visitors here, both regular and new, have increased a lot over the last few weeks. It's been a lot of fun. I started this blog as a personal hobby, but it's grown to be a lot more. There are times when I feel like I've bit off more than I can chew, but it's been great so far. I had a talk a few weeks ago with Badger 6, who feels roughly the same way I do- Bring it on, and we'll see where the ride takes us! You'll also find a new, hard link to my picture gallery, such as it is. No new pictures yet, but they'll be coming as soon as I have reliable upload capability again. The platoon has a new pre-mission sport now. We call it "Crete-put", or more simply "The Rock Toss". It's one of those activities that occasions a head shake and "I don't even want to know" from our platoon leader. It works something like this: Take a 15 pound chunk of discarded concrete, add some soldiers full of pre-mission energy, and a touch of lunacy, and you end up with guys running full tilt towards a line scratched in the dirt and hurling a big rock through the air. Eventually, someone will get hurt, I'm sure. We almost tagged an oblivious Marine tonight. Assuming we don't get bored before the inevitable happens, the Army will, also inevitably, release a safety brief warning us all not to throw big rocks. The modern military combines part big brother society with part warfighter. We soldiers are considered almost mature enough to understand that war is dangerous, and the weapons we fight it with are just as dangerous as the enemies. The military seems to trust that we will understand that we can't be running around post like cowboys with loaded weapons or explosives. On the other hand, the most mundane and common-sense workplace safety practices often warrant a official warning. These warnings are usually accompanied by graphic photographs of the one idiot who managed to mutailate themselves in spectacular fashion. Since I've come to Iraq, I've learned that you should not attempt to exit a moving vehicle or I may injure myself. I've been told that in the event of a rollover, I should not try to open the uparmored door that is now above my head lest I be crushed under it. I've seen pictures of what may happen to me if I hit my hand with a hammer, or get too close to a dirt auger. I now know that I shouldn't play with knives, and that opening the feed tray of a weapon while it is firing may be bad for my health. I have been warned on the dangers of cigarettes, and told that I shouldn't be drinking alcohol (not that doing so is allowed anyway). I know not to light fires inside tents, or any other enclosure, for that matter. It's only a matter of time before we're not allowed to throw rocks. The day started at 0630 with a wakeup call and a shivering gasp into the cold air. The heaters in the tents decided that last night was their night off. Brr. Now, the tent is heated by body warmth and the one remaining working heater. I laid curled in my bed for a few minutes, trying to will my body warm. Giving up on that idea, I slid quickly into silk weight thermals and my Nomex jumpsuit, and started getting ready for the mission. Just a couple of hours later, all preparations are completed, and we roll out of Camp Falluja on another route clearance patrol. Today's mission: ensure that some 30 kilometers of road, including three villages, are free of IEDs and other hazards to coalition forces. An hour into the route, on the outskirts of the first village, we find our first IED of the day. Tamped into an old hole by the side of the road, and covered with a thin layer of dirt, it is typical insurgent work. While the IED is being neutralized, someone notices a head popping up behind a wall some distance away. We move to intercept, and as we pull up, more heads appear. False alarm- we've roused a larger Iraqi family with our noisy trucks. Or is it? The wire that some fighter meant to use to detonate his bomb leads in the direction of the wall. As we follow it, it travels towards the wall and then veers away into a field. Out in the distance is a single house. The wire ends just meters away. Inside is a woman and her three children- two teenage girls and a little boy. Who's wire is this? She doesn't know. Where is the man of the house? She doesn't know. Has anyone else been here today? She doesn't know. Are there any "Ali Babas" (insurgents) around? She doesn't know. The gathering crowd looks up as one. Rooh lil bayt! - Go home! They scatter. Staff Sergeant J. looks up and says "Well, I guess your pronunciation isn't so bad they can't understand 'BOMB' ", and laughs. Krr-THUMP! The IED disappears in a cloud of dirty black smoke and flying dirt. A bare hundred meters down the road, we find the next one. It's turning out to be a busy morning. After we pass the village, we find a third at another intersection. The rest of the day turns up nothing, and we retrace our steps back towards Camp Falluja. On passing the first IED site, we discover that the destruction of that IED cut one of the nearby power lines, which now lies sparking on the ground. I'm not happy to see it, but I'm not that upset, either. On one hand, work will have to be done to restore the power, but on the other, the IED would have toppled the pole if it had detonated where it lay. The fact is that the damage wasn't as bad as it could have been- the irony is that the village is named Karma.